The full Avalon 1966 concert available for the first time. 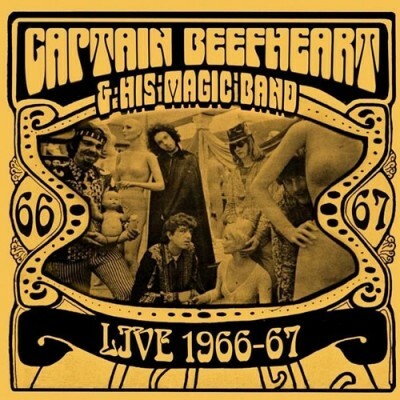 Captain Beefheart & His Magic Band are firmly established as one of the most imaginative acts to have emerged from late-60s America. The historically vital recordings preserved on this two-disc set capture Beefheart and his musicians as they emerge from their blues-based beginnings and begin to evolve into something far stranger. The set is accompanied by background notes and rare images. The advance publicity for this release caused a small frisson of anticipation amongst fans because some of the tracks listed hadn’t been heard of before. There also seemed to be some confusion over whether this was going to be a one or two disc set. The label, Keyhole, have already issued a number of live discs by mainly well known West Coast bands from the 60s and 70s. As I don’t have any of these I didn’t know what to expect. For a start there is just ONE disc and at just over 56 minutes in length it all fits on there easily enough, although the text on the back still refers to “this two-disc set”. Are there some previously unknown Beefheart performances? Indeed there are. The first section is titled “The Avalon Ballroom, 1966”. Most fans will probably be familiar with five of these tracks as they’ve appeared on the “Grow Fins” box set as well as a number of bootlegs over the years. But added to this are FOUR new tracks – “Down In The Bottom”, “Don’t Start Me To Talkin'”, “The Sun Is Shining” and “St James Infirmary” – that have never been released before. So, what we have now appears to be the entire KSAN radio broadcast … at long last! This is the early Magic Band playing the BLUES and they do it damn well. Don’s vocals on “St James Infirmary” are particularly worthy of mention. There’s a small fade-in to “Down In The Bottom” but otherwise this is a great sounding set. The second section of the disc is titled “Radio Station, 1967”. And this is where we enter typical bootleg territory …. the tracks are not quite what they’re said to be. First up is another version of “Somebody In My Home”. This is possibly from sometime in early 1967 but is more likely from a 1966 acetate rather than a radio broadcast. There is applause after it but is it live? There are sound problems but it’s the best quality I’ve heard it. The next four tracks – “Sure ‘Nuff ‘n’ Yes I Do”, “Call On Me”, “Yellow Brick Road” and “Plastic Factory” – are the wonderfully raw pre-“Safe As Milk” demos. These were all on “Grow Fins”. Again these would be from 1967 (although “Call On Me” is from 1965) but not from the radio, and not necessarily live. Then comes “Sure ‘Nuff ‘n’ Yes I Do”, “Yellow Brick Road” and “Abba Zaba” which have been taken from a radio broadcast, BBC Top Gear in January 1968. The final track is “Kandy Korn” (badly cut off at the end to remove John Peel’s voice) would be from the May 1968 Top Gear session. We are also promised “background notes and rare images”. If you’re expecting information about the tracks on the CD and the Magic Band members involved you’ll be disappointed. There are reprints of two fairly common articles, one from KRLA Beat (June 1966) and the other is Tony Wilson’s interview from Melody Maker (February 1968). The rare photos are not that rare. The cover is great though. It’s based on the cover of a 1968 (I think) copy of “World Countdown” with a fantastic photo by Guy Webster of the band posing next to a bunch of shop dummies. Another image from this photo shoot appeared in John French’s book. For the last few years Beefheart has been poorly served by the bootleggers (yes, I mean you Ozit) so my expectations have been lowered for every new release. However, here at last is a CD to get a bit excited about. There is something new at last to listen to. Okay, some may whinge about the sound quality of the second half of the disc but overall it’s well worth getting for that Avalon set even if you already have some of the later tracks. bloody amazing that this thing surfaced. thanks for the word. Do you know when it is due for release? Just got mine today (NEW MEXICO USA) Sounds great Don’s harp playing was good! Just got it, and your assessment is pretty accurate – worth getting for the uncirculated KSAN tracks. I believe some of the later tracks of demos and John Peel stuff are pulled from a boot CD called “Puller Man” which had the same fake applause and same crummy sound. I have the “Somebody In My Home” studio version on a boot that circulated on the internet as “The Alternate Safe As Milk” listed there as one of two pre-“Safe As Milk” “3/67 Original Sound Demos” (along with “Somebody’s Leaving AKA Almost Grown”). Listened to most of this set today. St. James Infirmary Blues is mind blowing. I first heard the Magic Band in the spring of 1966 opening for THEM at the Whiskey A Go Go club in Hollywood, and this KSAN set definately comes closest to what I heard at that gig, especially some of the more straight-forward blues numbers. Nice to have this even if some tracks are found elsewhere (in a few cases in a LOT of other places, but ‘whatever’ – just glad to have this.) By the way I bought it here in Seattle in October 2015, to my knowledge the first time this CD has appeared in this part of the Pacific NW.